I’m not a big fan of pop music. In fact, generally speaking I don’t listen to pop music. However, I do listen to Incognito—you might even call me a fan. Why? Incognito was co-founded in <?xml:namespace prefix = st1 ns = "urn:schemas-microsoft-com:office:smarttags" />London in 1980 by Jean Paul “Bluey” Maunick, who continues to lead the ensemble, along with bassist and co-producer Paul “Tubbs” Williams. They are considered the leading proponent of “Acid Jazz,” which was a popular fusion of Soul music and jazz along with African and Latin elements. Over the decades, Incognito has produced 13 studio albums and 12 albums of remixes, compilations and live recordings. Although they are leaders in terms of the quantity of music they have produced, my interest is in the quality of their work, especially during the decade 1993 to 2003. Born February 19, 1957 on the island-nation of Mauritius, located off the southeast coast of Africa, Bluey Maunick is one of the leading composers and producers of modern pop music. Much like Duke Ellington who composed for a stable orchestra, Bluey has maintained a coterie of musicians and has been able to progressively develop the Incognito sound. Incognito’s best known vocalist has been the Baltimore-born, American singer Maysa Leak. 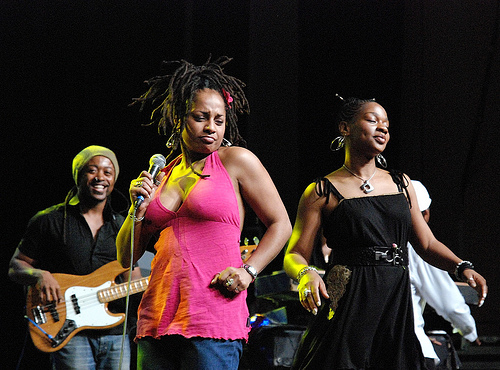 Incognito has always attracted strong vocalist as part of their signature sound. Some of those vocalists include Joycelyn Brown, Tony Momrelle, Carleen Anderson, Imaani and Kelli Sae. Incognito has a strong fan club and tour throughout the world and are popular throughout Asia, especially in Japan. Rather than a full overview I have selected a handful of their early popular recordings to kick off the mixtape and then followed up with selections from my four favorite recordings: 100° and Rising (1995), Beneath The Surface (1997), No Time Like The Future (1999) and Life, Stranger Than Fiction (2001). Although the fan club has voted Positivity (1993) as their favorite Incognito album, no doubt in part because it contains most of their top of the chart hits, I am more impressed by the craft and musical diversity on the four albums that followed Positivity. Beginning with 100° and Rising, Bluey established the distinctive Incognito sound: multi-part compositions, a strong vocal chorus in addition to capable lead vocalists, and jazzy instrumental accompaniment. I remember driving through Mississippi to a gig and listening to 100° and Rising over and over in the CD player. I marveled at the adroit string arrangements and the entrancing use of varied drum patterns beyond the usual 4/4 backbeat and stereotypical Latinish rhythms. Bluey took the best aspects of “smooth jazz” and mated them to a highly developed sense of composition that gave great depth to songs that otherwise would have been no different from most pop songs of their era. Incognito 30th Anniversary featuring Jocelyn Brown and Special Guests at Indigo2, Greenwich, London. Sat 22 Aug 2009, 19:00 .